I didn't grow up in church. At 16 a good friend started taking me to youth group. At that time I had been searching for something I just didn't' know it was Jesus. A year later I asked Jesus to save me and he has transformed my life. Before Christ, I was a daredevil who would try just about anything. I lived hard and fast. My mom died when I was 17 after battling breast cancer for years. I didn't realize at the time how much that shook my world. I was forever seeking approval from other people. Always longing to fit in. Fast forward to my 20s and while I was saved and there was a dramatic difference in my life I still didn't have a solid relationship with God. This was partly because I didn't know enough about him, no one discipled me. I started attending a very conservative church (and would be there for almost 17 years.) I met and married my husband there and had 3 of our children. In some ways that church was an important part of my spiritual growth but in many ways it held me back. See, what we were taught from the pulpit was vastly different than what we learned from our fellow believers. We were taught how Jesus' Righteous made us perfect but there was this constant pressure to be this perfect Christian. There was no room for being human or failure. Honesty and openness was frowned upon - you never shared your struggles or cried for help. It was not what the church should be. How can new believers life up to those impossible expectations. Thankfully God works on hearts! He opened my eyes in big ways over the last 5 years. He transformed my beliefs - and guess what it was all there in the bible all along. I gave it all to Jesus who can heal hearts, transform lives and joy abounded. No longer was I focused on working hard to be something I wasn't. I was just me. 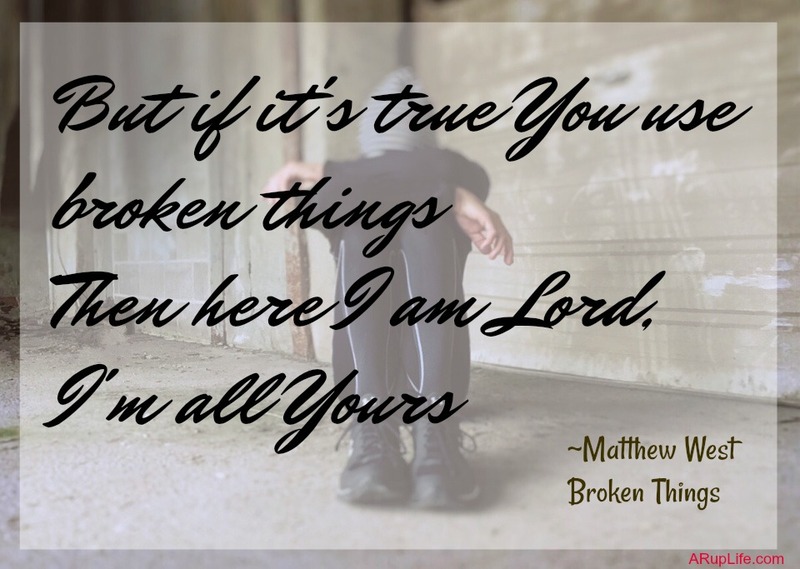 An imperfect, beautiful child of the King! I make mistakes, I fail daily but I never give up. I love the freedom in salvation. 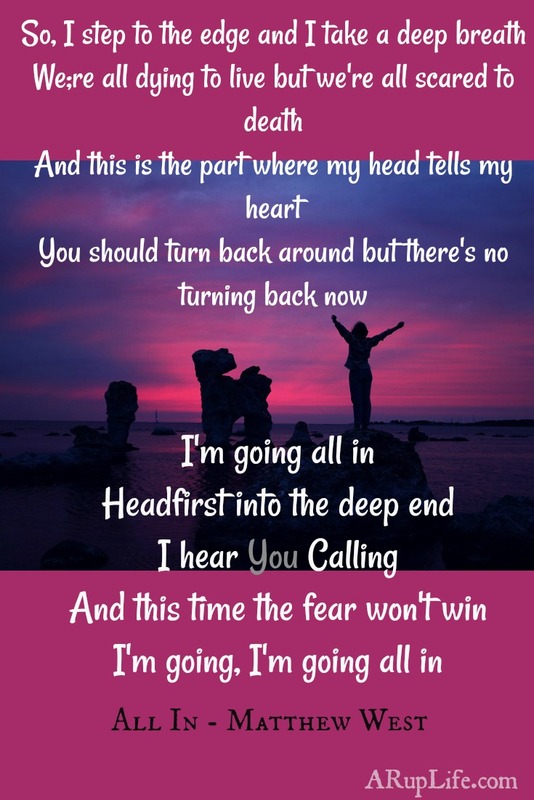 I'm thankful that I can be "All In" this christian life. For like-minded believers whose friendships I cherish. For a family that desires God's hand on their lives. I'm thankful that Jesus loves me, the ugly mess that I am made beautiful in Him! 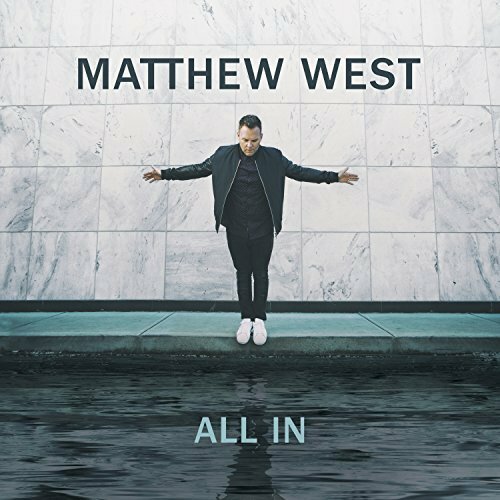 Matthew West has a new album - All In. This album speaks to me. Broken Things is perhaps my favorite song because I love the God uses us in our current state. He doesn't wait until we get things perfect - that is our mentality- He uses us and perfects us in His way! nothing back? 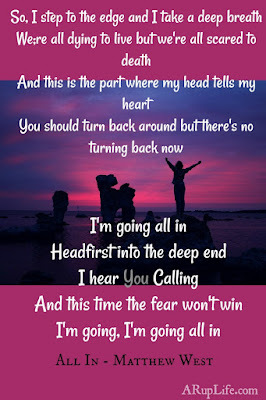 How can we go All In in the places that mean the most? 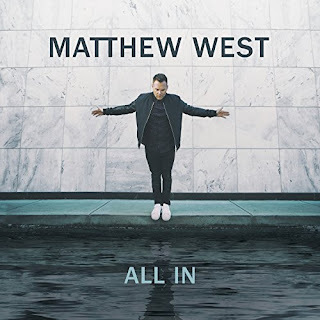 One lucky reader will win a copy of Matthew West All In! Has Church become your god? I was baptized when I was in the 5th grade but it was during the 1991 war that I feel I really got to know Jesus. About 5 years ago, I changed denominations and learned what worship was. I say all of that to say that for me, it's been a process and that the depth of my Salvation has grown over time. I love hearing stories of Salvation and when people meet Jesus for the first time! I think what salvation means to us evolves over time. From child to adult it is a big difference understanding just exactly what Jesus did on the cross and when I become a mother it changed for me again because I understood God's love for a child so much more. Thanks for sharing your story Dana!